I’m back from a week in California, and californians, I’ve got some things to tell you. First of all, I’m convinced Los Angeles is a manifestation of hell on earth and its denizens souls that have been bound to it for an eternity of suffering. It took us forty damn five minutes to park one evening. Hell world. San Diego was beautiful. Your zoo is cool and there’s a bunch of beaches. Restaurant service could be better and people on yelp rated something akin to Olive Garden 4.5 stars, so there’s some work to be done there, but overall, good city. Anyways, Magic. I’ve been out of the loop a bit so I don’t know exactly what everyone is claiming to be the best sleepers at the moment. This is to your advantage though; I browsed through the Guilds cards and have picked out three that seem like they could be underpriced. If my guesses match up with others, then you’ll have a good reason to look closer. Back in the days of Rise of Eldrazi, Consume the Meek was a powerful sweeper. Only taking out the small guys meant your bigger threats could remain uncontested, and doing that at instant speed was even better. With Ritual of Soot we lose the instant speed factor, but we shave a mana too, which is probably roughly a wash.
Back in Consume days you had access to Day of Judgment, so decks looking for a sweeper could go that route if they really needed one. We don’t have access to an unconditional four mana sweeper in Standard these days. Obviously Ritual isn’t one either, but it means there’s no directly better sweeper that it can be replaced by. Our closest comparison is Settle the Wreckage, which started at $2, and is now $7, having peaked at $15. I’m not quite that optimistic about Ritual, but I do think that a four mana sweeper than can have its symmetry broken is a strong tool to consider. I’m not loading up TCGPlayer to pay $5 for a set — buying cards during prerelease weekend is wrong 98% of the time — but I’d take these in trade at $1 all day. Is this the Dictate of Erebos of Guilds of Ravnica? Dictate was $.50 for awhile, and having been spared a reprint for quite some time, is a respectable $7. It took about two years to go from $.50 to $4, but if you had a large pile of them, that’s quite a healthy profit margin. Beast Whisperer could certainly swing that. Drawing a card with each creature spell isn’t new, of course. You’ll find it on the banned Modern card Glimpse of Nature, and reasonably-popular EDH card Primordial Sage. Beast Whisperer is the latest iteration, and possibly the best. Glimpses problem in EDH is that it only last a single turn. 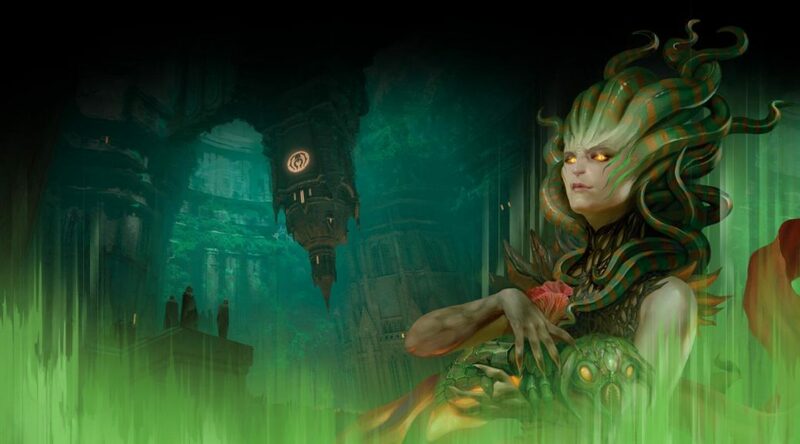 While this isn’t an issue in Legacy and Modern, where you’re looking to play your entire deck in that turn, EDH is more interested in long-term card advantage than singular combo piece. Primordial Soul accomplishes that, albeit at six mana instead of four. I’m betting that’s a pretty big jump. Many EDH decks should want Beast Whisperer, both today and in the future. If you’re green, you play creatures, and Beast Whisperer likes creatures. With a name like Beast Whisperer, how could he not? I’m expecting this to bottom out around $.50 or $.75 and then just keep rising in price in perpetuity. Divine Visitation is a fun card, both in execution and in form. (The flavor text is amusing.) It’s fairly easy to see where the appeal is here. Making a bunch of idiot bird tokens? (Birds are idiots.) Have some angel tokens instead. They’re four times bigger than idiot birds. Plus, they’re angels. One only needs to look at Anointed Procession to see that there’s some real hunger for white token effects. Now, I’m not foolish. It’s possible that the doubling mechanic of Procession is going to be wildly more popular than the upgrade mechanic of Visitation. And that’s fine, really, so long as Visitation is anywhere near as popular. Most decks that will want Procession will want Visitation. And seeing as how Procession jumped from $1.50 to settle at $8 — immediately after release — that’s a lot of potential for a mythic. Some of that was based on Standard demand, but the possibility of that still exists in Standard. I’m inclined to say that turning your two 1/1s into two 4/4s is better than four 1/1s, but that depends on the meta I’d imagine. Six dollars is still a little too high for me to be interested in purchasing copies. Hopefully we see this dip closer to the $2 to $3 bulk mythic range quickly, at which point snagging a good pile could be lucrative. You’ve got the short-term possibility of a Standard breakout, and even if you don’t get there, the long term EDH demand should easily catch this up to a $10 card or more. I’d be concerned with fall print run mythic numbers right off of Dominaria’s success, as far as Divine Visitation goes. There is argument for this maintaining a mid-level 10+ dollar range eventually, but I assume it will take 2+ years to see anything close to 15+ as the copies get drained from markets. If this is to be a hold, it is going to be very long term.